Red Carnations on a Black Grave is a mechanics-lite story game that's in development by Catherine Ramen. She's described it as similar to "Montsegur: 1244" and "Witch: the Road to Lindisfarne". I've only played the latter. For just over two months in 1871, the Paris Commune tried to make an egalitarian, socialist state a reality despite disagreement within their walls and attacks from outside it. This is the story of 12 Communards, their messy personal lives and their attempts to create a utopia in the face of impending death. How far would you go for what you believe in? Would you stand firm even if it meant your death? The game explores a very specific set of historic events set in France around 1871. I get nervous with historical games, because I'm not very versed in much of real history and don't like the pressure of being accurate in that context, especially as this is a game around political ideals that I'm not very familiar with. Fortunately Catherine pretty quickly assured us that bringing in any political knowledge won't be necessary, and the politics just sort of come into play with the context, but to feel free to concentrate on whatever character drama and minutia you find interesting. I wasn't the only one so concerned, and that bit of reassurance was very useful for us. Much like Witch: the Road to Lindisfarne, the game revolves around pre-built characters that each have a light framework around who they are. Interestingly, many of them have real historical context, although apparently only one (Louise Michel, a sort of "main" protagonist) has any significant documentation around her. There is total freedom in making these characters your own. The game is card-based, insofar as choosing characters, and random events that transpire, based on real historic events. Catherine had some help from fellow Gauntleteers in using the ability to draw from a custom deck, using Shane Liebling's RollForYourParty online dice roller / RPG tool. This was a great reference during play and when creating scenes, as you can assess who could be involved for maximum drama and effect. Additionally, fellow Gauntleteer Gerrit helped make a Google drawing of it which we used to fill in additional information during character creation and were able to color to quickly show which player controlled which characters. Super handy! In comparison, you can see how very useful this version of the map is. Kudos to Jason and others for formatting and simplifying this key piece of info. The game itself played very similarly to many simple scene-framing games (Fiasco, Fall of Magic, the other games mentioned above), in that a specific player controlled a specific scene in framing and controlling "Action" and "Cut". In general the scene they set should include one of their characters. The game is played mostly over 3 different parts: Part 1 during early days of the Commune’s existence; Part 2 after the attacks by the national army against the Commune, when hopes dims. Part 3 during the “Bloody Week” with the army assaulted and the massacring of many Communards. The character cards are excellent in their conciseness, and usefulness during play. They each succinctly explain the character and motivations, and are as easy to read as Dungeon World monster entries. What can I say? There were some few light and touching moments, but we played toward dark. Innocent people got dealt bad hands, and Part 3 is especially rough as you choose one of your two characters to die. The above example is probably from Part 1, when things are good. They get increasingly dark as times go bad. Even if you don't have a feel for the time period or politics or France or whatever, these gives you just about as much as you need to stay on tone and inspire scenes and events. There were two of our players who were new to Gauntlet games, and RPGs in general, but I wouldn't have known it if they didn't say anything, as they played beautifully. The table environment was great. We had drama, romance, and lots of darkness. Most characters came to pretty sad endings (at least half the characters will die during the game), but we did have one shining light: Camille, the young boy, was able to live a decent life. Perhaps that's the story of France moving on after the events. Probably one of the toughest parts in playing this online was the amount of moving pieces. 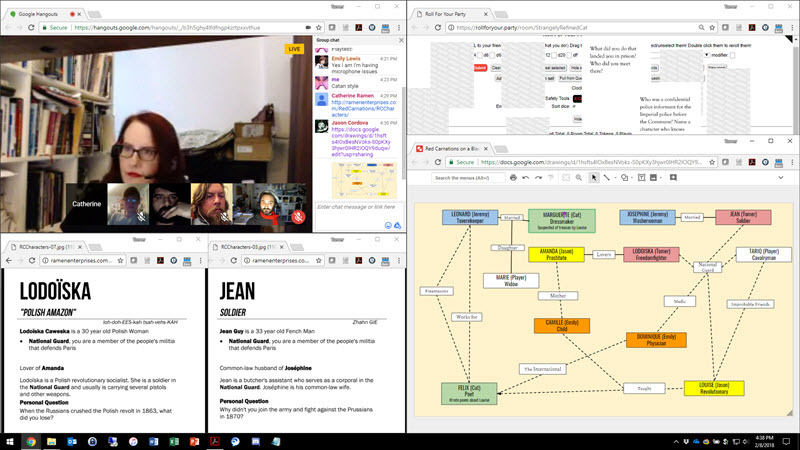 You can see on my screen that I was trying to take advantage of every piece of real estate: Hangouts window for players, my character cards, the rollforyourparty window in the top right for the game cards, and the relationship map in bottom right. It's a lot, and if it hadn't been organized well, it would've been hard to digest. I know one player had a tough time playing on an iPad, which required lots of switching apps back and forth. It all ended up working well enough for me, however, and it probably would've been somewhat trivial in a face-to-face game where you have all the cards ready to go, and in play on the table. Some elements of the game reminded me of another GM-less game I've thoroughly enjoyed called Heaven's Collapse (which I wrote about here). I thought both games were elegantly simple, and could allow anyone to dive into the setting and play without needing any sort of background knowledge. Definitely keeping my eye out for this one. Catherine has done a wonderful job in creating this game. EDIT: Looks like the video is posted, and with "production value"!